Once upon a time, at 8pm, you are unusually tired for this time of night. You make the executive decision to curl up in bed and allow a book to lull you to sleep. You’ve got several books on the go at the moment, ones you are enjoying tremendously, but you don’t fancy any of them tonight. You want to read something you’re not already invested in, something you can just read a couple of pages of before you drift into the inevitability of an early night and not remember anything you’ve read come the following morning. There’s a lot of crap on your kindle that you can’t be arsed with. 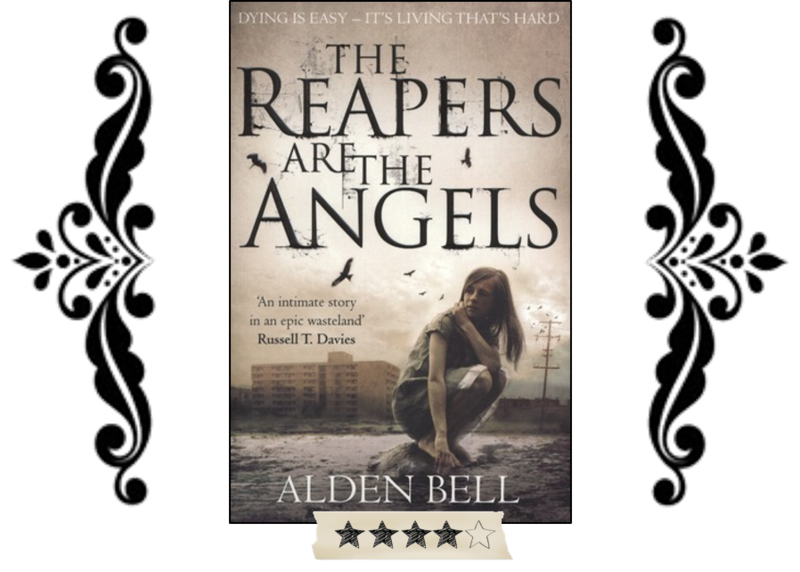 For some reason you’re drawn to The Reapers are Angels by Alden Bell. You’ve not in a “zombie novel” mood right now, but the cover’s enticing and the title is so weird. It’s an answer, but it’s also a question. You’ve tried this book before. You really hated the author’s decision to deliberately miss-spell certain words and to exclude quotation marks for all forms of dialogue. It’s a pet peeve you didn’t want to try and get past at the time, so you gave up before you had really begun, but tonight’s the night to randomly give it a second chance, it seems. After all, you’re going to fall asleep in a few minutes anyway, you’re just looking for something random to read to help you get there. The aforementioned writing style is still annoying, but interestingly it’s not that difficult to get past now that you’ve actually put some effort into it. You’re quite quickly blown away by the main character, Temple, a 15-year-old girl who is not a good person. She’s just your kind of anti-hero: kickass and unapologetic, secure in her inferiority, she kind of reminds you of Jodie Foster’s character in that old Candleshoe film. She’s a de-evolved futurekind, a girl born into the apocalypse, alone and raised only with the knowledge of how to survive. She’s a bad person because she has no reason to be otherwise, and it’s fascinating. You keep reading, if only to see when the plot’s going to appear, and that’s when you’ll put the book down. But then you realize the plot has already shown up, but it’s not what you expected. It’s about a chase, about a pursuit, about Temple’s relationships with the characters she meets and how they are each searching for purpose in a pointless world. You’re not worried about the world-building, which is shoddy at best. I mean, can someone explain why Temple has remarkable ease finding working cars, petrol and running electricity? But whatever, you’re not too fussed. Because the story is still good. You find yourself getting out of bed to make a cup of tea to stay awake. This book has hooked you, it’s making you think. It’s making you think about humanity, about values, about the way our species is obsessed with finding meaning in our lives, even when we know that, in the grand scheme of things, there is no point to it all. Then all of a sudden it’s 1am and you hadn’t intended on reading the whole thing. But that’s what this book did to you. It was so simple, yet not. So easy to read, yet so intense to think about. Despite its flaws, it grabbed you by the pyjamas and urged you to examine the state of humanity late on a random Tuesday night. This strange, clever little book, really was an unexpected gem.